Definition > Teasel - Dipsacus fullonum L.
The teasel has almost disappeared today. It still exists in some places in a more or less wild state but is no longer intensely cultivated as it was during the 19thcentury. Latin name: Dipsacus fullonum L.
Category: biannual herbaceous, basal rosette the first year, erect flowering stem the second year. Foliage: the oblong leaves of the rosette are persistent and disappear before the plant blooms. During the second year, the leaves along the floral stem are wrinkly, oblong and their median vein is prickly. Fused into pairs and opposite, they form small cups that retain water. Bloom: high angular stem with large ovoid flower heads surrounded by a ruff of long bracts. Colour: small mauve flowers regularly placed between spiky bracteoles of flower heads. Height: 1 to 2 m the second year. Soil: rich, deep, cool to humid, often clay. Location: sun, along roadsides, rivers, ditches, in wasteland. Origin: Europe, North Africa. Naturalised in North America. 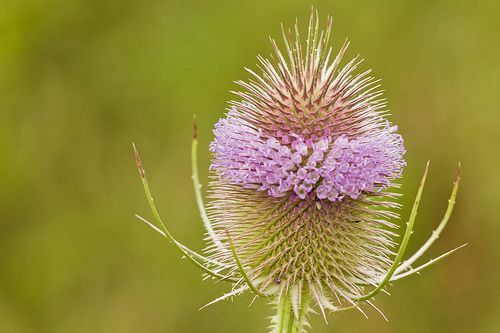 Teasel was mostly cultivated near manufacturers of fine linens, there were still 2,500 hectares of teasel crops in France in 1862 in Victor Hugo’s time. Teasel was grown for export in St-Remy-de-Provence for almost a hundred years...it was also widely grown in the Picardy region. According to sources it was also grown in other regions and towns. Aude: in the Elementary Geography of the Aude département (1875), Ditandy,1875: "Teasel, which requires clay and deep soil, is no longer a preferred crop. It depletes the soil and, since the marked decline of the cloth industry, no longer provides such a good return. It is, however, found in Donazac and Alaigne and much still grows in Brezilhac. " The Tarn region: in Ch. Portal, The Tarn département in the 19th century, it is noted that "8 ha of Fuller's teasel (30 quintals worth 1,305 F) " were listed. The Bouches du Rhône region: "Charleval is located in the Durance Valley. I picked Fuller's thistle there with my father until 1970, the year all the farmers pulled out all the mature plantations because, if I remember correctly, the Russians, to which Cavaillon and Avignon shipped thistles, had signed better contracts with Spain. " In Alsace: The Flore Vogeso-rhénane by F. Kirschleger, 1870, mentions teasel: "Widely cultivated in a few cantons, especially Bischwiller, Hoerdt, (Ober)Rausbergen for use by wool carders". Its German name was weberkarden. In Germany: TheKrünitz German Encyclopaedia (19thcentury), mentions it in the regions of Halle, Leipzig and Silesia. In Great Britian, it was cultivated in the region of Wrington in Somerset and in Essex. Sheep are generally sheared in May; however, at high altitudes, sheep are sheared in February: thus, when the flock is outside, the wool will have regrown and the sheep will not feel the cold. Shearing is carried out using special scissors called shears: two triangular blades connected by a steel spring. The wool forms a consistent fleece but is greasy and must be washed and left to dry: this stage is called scouring. Once washed the wool must be untangled and the remaining bits of dirt and pieces of plants must be removed: this stage is called picking. If this step is skipped, the dirt will be incorporated into the thread making it irregular and less solid in certain places. To open the wool it must be untangled by hand or by machine: the wool is held and pulled upwards rapidly using both hands until the fibres are correctly spread out. Then the wool is refined and sized. Once the wool is untangled and cleaned it must be combed and carded. After carding, the wool could be spun, but to produce a better quality thread, it was best to comb it again. Strips of very fine wool are extracted from the comb, which can be used to make dolls that are placed in the distaff to be spun. The spinner passes the distaff through her belt and under her left arm. She introduces the wool and begins the thread by stretching the strands of wool and twisting them by hand. Periodically, she rolls the thread around the spindle.